I am in love. Alfa Romeo’s have always had an emotive pull on me, lighting up the enthusiast fire within. Every car guy needs to own an Alfa, but it was never just any Alfa for me. The new ones haven’t fully lit the fire. I considered a 4C, but backed down when I read the reviews. I then considered a new Giulia, but my anxiety with buying fast depreciating new cars meant it was probably never going to happen. I just can’t drop that kind of cash on a new car. 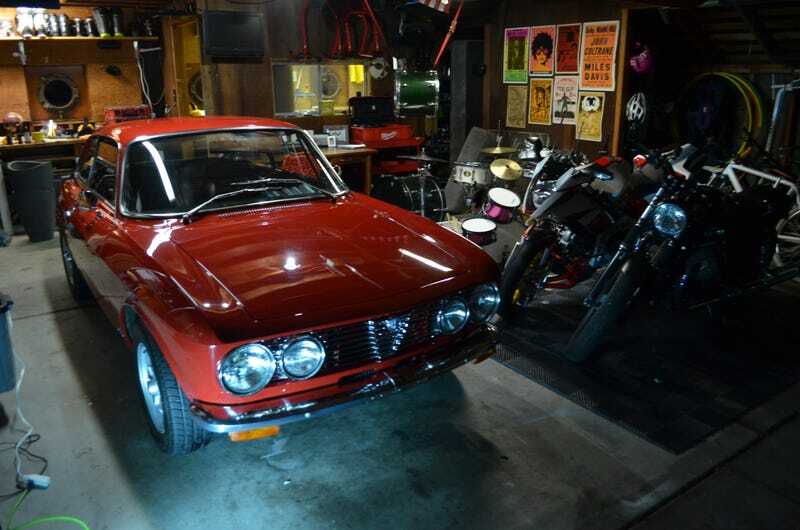 If there was ever going to be an Alfa in the garage, it was going to be a classic. My very first job ever was as an errand boy at Norwood Autocraft, a Ferrari service shop in Dallas, and somehow the Italian marques have locked me up. I’ve dabbled in everything, most notably having had a Lotus Esprit, Lotus Exige, Integra Type R, BMW M3, and a few others, but I now find myself with 4 Italian machines at my disposal. In the garage I have a Moto Guzzi and Bimota. My daily driver is a Fiat Abarth that I bought half off at just a year old and 8k miles on the clock, and two weeks ago, I added the Alfa. I had been passively looking for good GTV’s, but like all classics, the high prices for crappy examples that kept popping up online had me on the sidelines. Then luck struck. In a unmarked warehouse in downtown SF, just down the street from my office rested an incredible collection. A treasure trove of affordable classics. Lotus Elan’s, Cortinas, Alfa GTV’s, Giulia’s, and some quirky choices, like VW Things. It was a Jalop’s paradise. I walked by a few times before finally asking, “Is anything for sale?” “Why yes, what are you looking for?” I saw the GT’s and zeroed in. The owner had 16 GT’s, all restored, all in an excellent state of tune, all straight, no rust. He had every year, every configuration. Did I want a 1750, a slopenose, a 2000 GTV? I wanted a 2000. I like the quad headlight look more, wanted the LSD, and preferred the 2 liter. He had 5 available. What color did I want, what spec? I found a beautiful blue example. That’s the one. “Already sold.” Well crap. “What’s the best one you’ve got?”. He led me over to a beautiful red 1974 GTV. Only 26k miles on the clock. It spent most of it’s life in a garage in Japantown unused by the original owner. Not quite pristine, but easily a 4 out of 5. I never wanted a 5 out of 5. I wanted a car I could drive, a lot. He had upgraded a few things, moved the battery to the trunk. He had converted it to carbs and deleted the radio, antenna, and reflectors in the fenders. It had a respray with some faults, but everything had been rebuilt and refreshed. Everything worked. The dash is perfect and seats are reupholstered. It’s a perfectly usable and showable classic. After the rebuild, he drove it from SF to LA and back, but it had been idled since then, not registered since 2013. I checked it over with magnets and on the lift and could find no faults. I wanted it. I asked the price. He gave me a price at least 40% less than I expected. I maintained my cool, and I drove it home. Since then, I’ve put 500 trouble-free miles on it. It takes a few turns to start, and I had to get used to the controls. The turn signal in particular threw me for a loop. It’s a very delicate action and your first instinct is to use the stalk that controls the lights. The turn stalk is a shorter stalk, inwards from the light controls. The driving position is classic Italian. Big thin-rim steering wheel that sits between your legs, slightly splayed due to close pedal positions. The steering ratio is high and there is no power-assist. I was surprised by how modern it handled. I live on a great curvy California road, and despite a little bit of float and vagueness on turn-in, the balance is superb. The gearbox has long positive throws, and 5 speeds was pretty forward thinking for 1974. The synchros in 1st and 2nd crunch when cold, so double de-clutching is a must. Doing a 2 to 1 shift on takeoff limits the 1st hear crunch. One area I would love to work on is the sound. The engine doesn’t make the sweetest sound, a little raspy and tinny. Despite the carbs, there is little intake roar. I’ve also got no rear seatbelts. The wife said I’ve got to install them for the kids. I said “No fun”. She held her ground. The seatbelts arrive on Monday. One other issue that the GTV’s have is that the modern replacement seals for the doors and trunks are notoriously too thick and stiff. My car has full replacement seals, and as a result, the doors and trunk didn’t close perfectly flush. I had to do a little bit of adjustment on each, but have solved the problem. It still takes a strong shove to close each. I also ordered a softer set of seals to see if that fixes the issue. The softer seals don’t last as long and don’t seal as well. I don’t plan on driving in the rain, so I’m not too worried. Rain and a 40+ year old Italian car are not a recipe for longevity. The problem with the harder seals is they can tweak the door over time, requiring it to be bent back into spec. Overall, I’m over the moon. I got a great price on a well-maintained, well-loved classic Alfa and look forward to every sunny day.